Season 3, Episode 12. 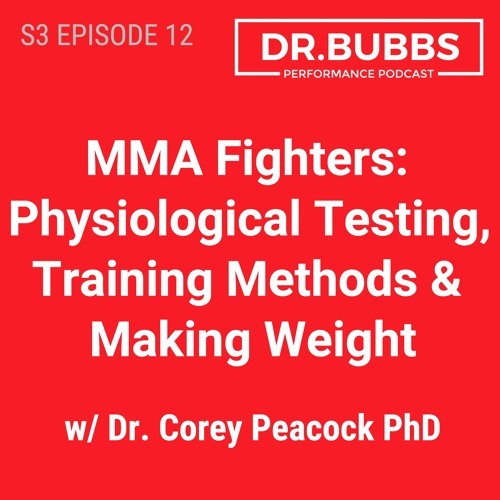 Dr. Corey Peacock, expert physiologist and strength coach dives into his work with elite MMA fighters, such as recently crowned UFC champion Kamaru Usman. Corey discusses the importance of understanding the physical demands, the key physiological tests he uses to assess an athlete's profile, fitness level, and performance metrics to guide the training plan during camp. He also shares tips on making weight for fighters, his research on sleep, physical performance and injury in professional MMA fighters, how to mitigate head trauma and his work for the Society for Neurosports. Finally, Corey shares his thoughts on the evolution of research in MMA combat sport. Go to drbubbs.com/podcast for full show notes.